I am an experienced magican, I do lots of card and up close magic. I really enjoy doing magic, but whenever I mess up somehow, there is always that one person who takes advantage of it and makes me look even worse. Do you have any advice on how to handle these people? The magical profession can be one of the most satisfying yet most frustrating careers a young man can choose, so it is most important that you learn to deal with your critics early on. I, too, have had my share of detractors, many of whom were openly bent on my ruination. Hopefully your heckler is not quite so extreme in his disparagement, but just in case, here are a few techniques that have worked for me. Overwhelm them : When an audience member becomes threatening, try stepping back, eyes flashing as you grow taller, and surrounding yourself in menacing shadow. The little blighter will cower back into his seat with a whimper. Works almost every time. Make them figure it out : If the interruptions cause you to forget the words to your spell, dupe the audience into remembering them for you. Mumble a few tries and then sit in exasperation until one of them blurts out the correct password. Claim that you knew it all along, and it was so obvious that you thought you would let the crowd give it a try. They will be grateful and amazed. Revoke their power : Occasionally, there arises in your audience a pest who thinks he has more skills than you. He'll work in the background doing his best to foil your efforts. You must march up to his ivory tower, call him forward, and break his staff. If he doesn't have one, simply bash him on the head. Let him put that in his pipe and smoke it. Sneak Attack: Organize a force of, say, nine people to attack your adversary from different directions. Send in the short guys from behind for the final blow. 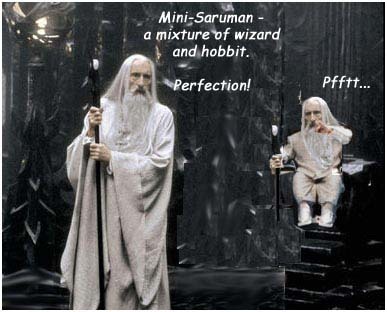 13 dwarves and a hobbit is also a succesful formula. Hope these have been of assistance. My dear Lord or Lady: I have situation with which I need help. My father, who is not a terribly easy man, expects me to travel to a mystery city so that I may discover the meaning behind some very strange dreams that my brother and I have been having; mobilize our dispirited people to victory against the IRS (Internal Resources of Sauron), and then assume the post of Steward, and I would do this. I would see daddy's wishes granted. I expect to have a success with the first campaign, I'm still working on a strategy for the second campaign, but I'm completely lost as to the third campaign: assuming the Stewardship. The problem is that although I have put on a very good face to make daddy happy, all of these years I have long desired to enroll as a student in the Houses of Healing. Sure, I love military action (it's more exciting than working out at the gym) and designer clothing, but my true purpose is not to be a Steward. I think my brother would make a wonderful Steward - it would be his chance to shine, since I have always been the apple of daddy's eye -- except that daddy hates my brother. All of my responsibilities are burdening me so much that I have become obsessed with jewelry and have been enduring terrible nightmares of some very chesty creature shooting me with arrows. So I thought that if I could start a chain of events that would result in daddy burning himself in a pyre, I could get rid of the source of all of this trouble. Problem is that I have a sinking feeling this chain of events has to begin with my death, probably by that chesty creature, and I don't much want to die. What should I do? Even the very wise cannot see all ends, and it may be that you will not be required to take up the Stewardship. If you encounter an orc that can shoot straight then you will be unlucky indeed, for usually they can kill with arrows only by blackening the sky with shafts. If that should be your fate, though, it is at least better than being dragged into a huge chasm by a fire demon: I pity the poor fellow who faces that end. Two matters concern me: your plan to cause your father's death and your obsession with jewellery. The first is an Orcish scheme and not to be countenanced by their enemies, whereas the second may yet bring you to calamity if you are not careful. Be mindful of the words of the Wise, and remember that the insanity of a ploy is measured only by that of those who devised it. It is in this spirit that I advise you to ride thousands of miles away from the battle to quote some poetry to an Elf, a Wizard and some little men with hairy feet because a voice told you to in a dream. There is not one in the White Council who would not advocate this course of action, which seems to me the sanest in your predicament. I have a friend who has recently started acting very strange. She is really mean and rude to her family, especially her parents, but she doesn't have a reason to be angry or act so cruel and unkind. She seems to think that she is too good for her family. She is trying to pull me into it and make me be on her side, but I don't feel the same way as she does and I think she is over-reacting. What should I do? She has it, my precious. You should not let her have it. Takes it from her, takes it from her and hide. I have a problem that is sort of embarassing. You see, I'm a bit of a glutton. I can't stop eating. It would be alright if I was a hobbit but being a human it really isn't good. How can I stop this addiction with food? I do not know very much about humans. When I see them I tend to eat them or feed them to my children. I prefer the fat and juicy ones, by far. Too many of my meals need tenderizing. I do, however, know what it means to hunger after something, and yet hate it. If I were you I would forget about what you look like. After a good meal you should be belching darkness anyway, so no one will be able to tell the difference. I've been described as swelling to a shape so vast and hideous as to frighten the Lord of Evil. There is something to be said for impressive girth.